The first lawn mower was invented in the year 1830. This was the push lawn mower which had 5 to 8 spiral blades that spun near a rear stationary blade. There were no motors or anything to power this type of lawn mower. All you had to do was push the mower in order for the blades to rotate and cut the grass. Once you stopped pushing the lawn mower, it stopped cutting. These mowers, of course, were very limited in their cutting ability and they usually left uneven lawns after they were cut. Push mowers might have been good in the old days when there were no other options available. But in modern times, there are plenty of more convenient mower options which produce much better results. The modern equivalent to the push mower is the cylinder mower. Their designs are similar, but the cylinder mower gives more precise cuts to the lawn than the push mower. Inside the cylinder mower is a barrel which has a series of rotating blades on it. Like the push mower, it also has a stationary blade fixed to the rear of it as well. As the barrel turns and causes the blades to rotate forward, any grass exposed to it will get cut against the rear blade. Cylinder mowers are recommended for cutting grass that hasn’t grown too long. If you’re the type of person who likes to cut their lawn every week or so, then a cylinder mower is perfect for you. But if you’re cutting grass that hasn’t been mowed in over a month, you might want to try the more powerful rotary mower option. The biggest upside to the cylinder mower is that it’s cheaper and quieter. So, at least you won’t wake up your neighbors if you like to mow your lawn early in the morning. However, some of the newer cylinder mowers are made with motors inside of them, but you can still find some models without motors. The rotary mower is the standard type of lawnmower that most people use today. The traditional rotary models run on petrol which makes their cutting abilities more powerful. Rotary mowers basically consist of a horizontal blade on the bottom that spins clockwise. As you push the mower over grass, the spinning blade cuts it. You aren’t required to push the mower in order to spin the blade because the blade rotation is powered by the petrol (or electricity if you have an electric mower). 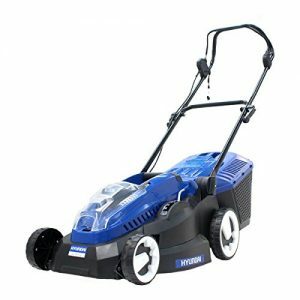 This allows its cutting power to be strong enough to handle longer grass that the cylinder mower can’t handle. If you were to come to a house that has overgrown grass which hadn’t been cut in over a month, a rotary mower is definitely what you’d want to use to cut it. Rotary mowers can also cut lawns faster, which is why they’re the most suitable for cutting larger lawns. There are so many different types of rotary mowers available on the market. The two most popular rotary mowers are the push version and the riding version. The riding rotary mowers are great for people who don’t like pushing mowers outside while physical exerting themselves. Riding mowers are like a cross between a rotary push mower and a tractor. It still has a horizontal blade on the bottom just like the rotary mower. In fact, some riding mowers have multiple blades underneath to ensure that longer grass gets cut properly. To operate it, you just turn on the engine and drive the mower over the grass that you want to cut. These are certainly the most expensive type of rotary mowers, but they are also the most comfortable to use. If you have a big field of grass to cut, you can’t go without a riding rotary mower. Electric mowers can refer to either rotary or cylinder mowers that have motors powered by electricity. The two greatest benefits to having electric mowers is they are lighter to push and cheaper to operate than petrol mowers. Of course, they are not as powerful as petrol mowers either because the electricity doesn’t bring as much power to the blades as petrol would. However, electric mowers still do a good job in cutting lawns that are small to medium in size. They will even cut lawns quietly so you won’t disturb your neighbors. Many of the newer electric mowers have built-in batteries, which means you won’t have to run an electrical cord across your lawn just to cut the grass. The battery can be charged the same way the battery in your phone can be charged. One charge should give you enough power to cut all the grass on your regular-sized lawn. Check out our reviews of the best electric lawn mower. Petrol mowers have been used for decades now. They provide a much more powerful cut to grass than any of the other mowers. This makes them suitable for cutting grass that’s overgrown or thick. The downside is that petrol mowers are heavier, which means it can be difficult to push them if you’re using a push-style petrol mower. Some of the newer petrol mower models have a self-propelling feature which reduces some of the effort needed to cut the grass. If you’ve got a big lawn, then a self propelled mower is a good option. These will require more gas, of course, but that is to be expected for a mower that drives and cuts at the same time. Overall, petrol mowers are not going to go out of style anytime soon because they are still far superior in strength than any other type of mower. Check out our reviews of the best petrol lawn mowers. The hover mower is a futuristic type of rotary push mower that has spinning blades and an impeller just above them. The impeller pushes air downwards through the blades which causes the mower unit to actually lift up off the ground. The only part of the mower in which the grass touches are the blades as they’re cutting it. The rest of the mower floats over the grass, making it easy to push around. In order to achieve the lift easily, hover mowers are made with lightweight plastic bodies. The only part that really weighs anything significant is the electric motor that powers it. As for the downside, hover mowers don’t really cut well in rough terrain or on lawn edges. But they can still be used on steep slopes and areas with a lot of weeds. Another futuristic mower that people are trying out is the robotic mower. Similar to the robotic vacuum, a robotic mower is a self-mowing unit that will mow your lawn all by itself. You don’t have to monitor or control it in any way. All you have to do is place a border wire around the area of your lawn that you want to be cut. The robotic mower will sense the boundary lines from this wire and will only cut inside of this boundary. These are great for people who don’t have the time to mow their own lawns or have a disability which prevents them from doing it themselves. The only real downside to the robotic mower is the price since many of them cost more than £800. But if you’re someone who wants a convenient way to cut their lawn without having to operate a mower, then the robotic mower is the next best option. check out our reviews of the best robot lawn mowers. Read our guide on choosing a cordless lawnmower here.